Finding an intact skeleton of a dinosaur is rare enough: some of the famous specimens that look complete actually aren’t, with gaps filled in by guesswork, or from other skeletons. Partial finds are much more common — but even then, compared to all the dinosaurs that ever lived, the number that survive in some form as fossils is tiny. Every find provides new clues: an impression of skin, the hint of a feather, the presence or absence of marks which tell us how dinosaurs stood or walked.This book is about the holy grail of paleontology: mummies, i.e. remains with soft tissue preservation. They can tell us an astonishing number of things about a corpse, and they can even include preserved biological molecules that can be tested — perhaps even DNA. This book goes through the past discoveries which have fuelled hope for soft tissue preservation, and given a lot of food for research in themselves, but the main point is an almost totally preserved specimen from Dakota. It includes background into the research and the discovery, and then a few chapters on what’s happening now. Frustratingly, it went to print before the research was complete, so readers might be left wondering if the Dakota mummy was ever successfully scanned, etc, and what that might have revealed.It’s very much a work on an evolving situation: there’s more to learn from Dakota than is contained in these pages. That’s for sure. But that could be the case for years and years to come, so I’m glad this book exists and is accessible to laypeople.Originally posted here. I've been pretty out of the loop on dinosaurs for a while, and this book seemed like a cool place to jump back in. I appreciated the history of soft-tissue findings that filled the first chunk of the book, though they were presented in such a dry fashion that little of it really stuck. It was valuable for someone with no knowledge of the subject to fully appreciate how amazing Manning's particular find is. Most of the book was equally dry and somewhat disconnected, so it was definitely a slog to get through. More pictures would have been a huge help, as it was hard to visualize the processes he described, and I found myself constantly Googling species names. The best parts are toward the end, full of anecdotes about the quirky paleontologists on the project, and the challenges of trying to run a CT scan on a massive fossil chunk with NASA's help. The book seems to have been published prematurely, unfortunately, as after you drag yourself through the entire build-up, the author reveals that they have not actually done much analysis yet -- the secrets are still in the grave. Still, not a bad snapshot of the current knowledge of soft tissue fossils. It was a laborious read, once he actually began talking about the processes and science behind the dig site. I was very disappointed that there wasn't much information about his actual find, which I thought the book was about to begin with, and that most of it was a literature review and study of previously discovered mummies and fossil discoveries. It took me 5 months to finish the book, mainly because I gave up halfway through and set it aside to read things that were better. My desire to start the new year off with no books started this year finally got me to trudge through the rest of it.That said, some parts were very interesting, and I just wish that he had more discoveries and more to show for everything that it took to read it. My biggest problem with this book is that the end has nothing about the mummy, and he jumps back into his "this is what was done before" talk. If the research wasn't accomplished, then maybe he shouldn't have bothered to write a book about it yet. A worthwhile library read, but unfortunately won't tell you a lot about what was learned from the particular dinosaur mummy that is its subject. How do those people know what something that died so long ago looks and acts like? I'm not a student, nor very scientifically minded, just curious. Reading this answered some of the questions I had and threw in an entertaining read.A few spots may have lost me but now I want to know more. I enjoyed this book. 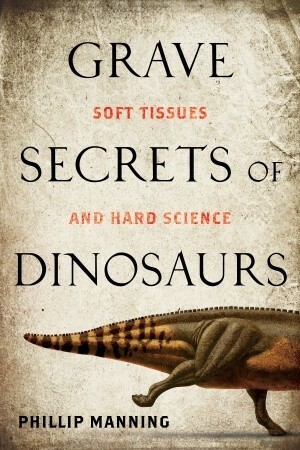 I came across "Grave Secrets of Dinosaurs" the day after seeing (and despite all improbabilities, loving) "Jurassic World". So how could I resist this story of a young hadrosaur nicknamed "Dakota" by its discoverer, a teenage fossil hound, on his family's property in North Dakota? British scientist Phillip Manning tells the story of his own improbable meeting with the youthful paleontologist, and the exhumation of is believed to be one of the most complete "dinosaur mummies" ever unearthed.Dinosaur mummies, by the way, are still fossils, but fossils that were preserved so soon after death that even major parts of their non-bony tissues were mineralized. Dakota, for instance, is believed to have most of its skin envelope intact, as well as tendons/ligaments and other tissues. From the excavation of a separate tail portion of the dinosaur, Manning and others have recovered biological fragments. Before raising our hopes of seeing a real life Jurassic Park, he assures us that these molecules are not DNA. Instead they are apparently the amino acids (protein building blocks) the dinosaur's DNA coded for. Manning spends most of the book dealing the hard science of extracting the several ton block of sediment encasing Dakota from the Badlands of North Dakota and searching for a peek inside. Even a NASA scanner proved unable to completely penetrate the mass, and Dakota is still not completely unearthed to this day. In the meantime, Manning's teams have teased out enough information to solve one question dino-fanatics long to know: could a herbivorous hadrosaur like Dakota run fast enough to escape a T. rex? The answer is a resounding "yes"! This book was extremely frustrating to get through. While it did provide a nice overview of many past dinosaur "mummy" finds and went into a lot of detail regarding how paleontologists work, there was very little information on the actual dinosaur this book was supposed to be about, a complete Edmontosaurus with mineralized skin. The reader is left hanging at the very end of the book, with no clue as to whether the body block of the dinosaur was going to get a complete CT scan. This was after reading through two thirds of the book just to get past the historical and biographical info. As such the author had very little topic-related information to provide, and even explained at one point that he could not wait to see what happened before writing about it because the book was due to the publisher! Other authors have successfully pushed back their deadlines so I'm not sure why Manning couldn't, except that this appears to be his first book and he must be unfamiliar with the publishing world. This book could have waited a good two more years and the reader would be much better off for it. I was disappointed in this, I have enjoyed Paleontology since I was a kid and so I have continued in an amateur way to follow the field and so I wasn't surprised in a lot of the techniques described in the book. I suppose what I found the least helpful was that the book, I'm sure to make publishing deadlines, came out prior to a lot of the results of the particular dig in questions results being completed and so there was really very little concrete addition to the overall understanding of dinosaurs and in particular Edmontosaurus (the excavation of the dinosaur with soft tissue the book is centered around)because much of the results still needed to be processed. Rather than revealing a major discovery, this book seems to be a basic synopsis of "what paleontologists do". It seems as though the author nearly missed his publication deadline so the book became 90% facts about paleontology, 5% information about the Dakota mummy, and 5% biographical info on himself. If only he'd waited a few years, he could have published his findings solely about the dinosaur mummy. You will be disappointed by this book if you are hoping there are major revelations within. You won't be disappointed by this book if you have no prior knowledge about paleontology (because, let's face it, paleontology is rad). I'm starting to realize that my reading of science books parallels my experience with science classes in college. I was great at the labs, the practical stuff, and I love reading about the actual digs and prep work. When they get into the deeper book stuff, I wander a little bit. That isn't helped in this book's case by the fact that Manning can go really far afield with stuff that only minimally ties back into the story of Dakota.Not a bad book, but I'd recommend the hour long documentary Dino Autopsy as a more definitive experience. Non-fiction 567.9 One of the best science books I’ve read this year. Manning is an English paleontologist with a lovely sense of humor and a fine writing style for the armchair scientist. A fossil hunter in North Dakota discovered the tip of a “mummified” dinosaur. “So what,” you say. A mummified dinosaur is an incredible find and Manning tells us why and details all the different people needed to translate the information recovered. Absolutely fascinating. What a let down. The book is ok. However, the whole interest is what was learned from the fossilized skin and other soft tissues. Manning tells you too much about himself and too little about the reason you picked up the book. Then, oops, I am up against my editor's deadline and we have not finished out studies to begin to tell you (the reader) about the fossilized skin or soft tissues. What a let down. I enjoyed the book because it touches on two of the things I enjoy: paleontology and technology. While the book doesn't go into much about "Dakota," the dino mummy, it does detail much in the background of the work involved in getting the fossil out of the ground as well as a history of paleontology. I hope at some point a second volume is written to finish the tale of "Dakota," because it ends with the story unfinished. Very interesting book, showing how paleontology works today. It also gives a brief overview of other dinosaur mummies. Unfortunately, the book ends before work on the Dakota mummy ends (and the author fails to explain why this was done). Also, dinosaur (and other) fossils are explained from an evolutionary viewpoint (such as dinosaurs "evolving" into birds). Very educational book. I learned a lot about dinosaurs, where they have been found, and the forensic nature that scientist can use to figure out how they died. Really makes me want to experience a dig. The fact that this book describes a mummified fossil is very exciting and very rare. It was also located not far from where we live now. Good read for scientist and curious dinosaur lovers alike. It was well-done and gave a good view into paleontology. It lacked in two main areas. First, the underlying facts needed to be gathered first to complete it. Secondly, the blanket overview of all of paleontology detracted from Dakota. I really enjoyed this book and I even found myself getting excited as they discovered more and more about their mummified dinosaur. It was an interesting read and I would highly recommend this book to all dinosaur lovers out there. This book had an excellent premise. It had a really poor follow through. I read 5 or 6 other books while trying to finish it. Centerpiece is an attempted CT scan of the dinosaur "mummy"...but the book was published before the results were in! Really liked this book. I started looking at it for research purposes, but couldn't put it down and found myself reading the whole thing in a little over a day. One of those books that skips around for what feels like forever before it gets to the point, i.e. the subject matter that attracted you to the book in the first place. This book is packed with detail. Almost too much detail. While very interesting, some parts were just bone dry. Pun intended. Excellent premise, but not the most well written book. The concepts were interesting, though.